In the last post I covered voicing and place of articulation for consonants. In this one, I’ll go over the other major feature: manner of articulation. The error is that “has” should be “have”. The video simplifies things a little at this point and identifies the subject as estimates, which is why the verb should be plural “have” instead of singular “has”. This is a perfectly acceptable simplification too – the actual story is more than business writers need to know about. 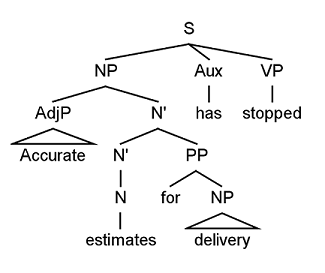 NP stands for “noun phrase”, VP stands for “verb phrase”, PP is “prepositional phrase” and AdjP you can probably guess is “adjective phrase”. Aux is an auxiliary verb. When you look at the sentence structurally like this, you can see that delivery is not really “next to” the verb at all. It’s tucked away inside a much larger noun phrase, and it isn’t in the right position to act as subject all by itself. When we plan sentences in our heads, we’re not planning linear strings of words, we’re planning something more hierarchical, like that tree, and I bet this agreement problem crops up less in speech (although that’s an empirical question I suppose). Anyway, the point I want to get to is that the subject is not a word like estimates but a position in the sentence. In particular, it’s the noun phrase daughter of the sentence. So the true subject here is the entire noun phrase accurate estimates for delivery. It has always struck me as odd how much attention agreement gets in prescriptive grammars. Why is this such a big deal? There’s almost no agreement to speak of in our language. First, agreement is limited to verb-subject agreement. Second it’s limited to the present tense. Third, with the exception of to be, verbs have only two present tense forms: -s for “third person” vs. no suffix for “everything else”. Look at an Athabaskan language for goodness’ sake. The fact that English speakers need a ten minute video on have/has starts to look a little absurd. The passive voice is famous for its vagueness. It lets us say what happened, without mentioning who did it. In fact, this is often the only thing that people know about the passive, and it leads to anything vague being labelled as passive. But ‘passive’ refers to a very particular grammatical construction, and I think we should get our terms straight. So in the interests of public education, here is a list of ways that we can be vague about agency without using the passive. The next time someone says something is ‘passive’, check here to see if it really is. So the grammarian tells you that you shouldn’t put prepositions at the end of sentences. And you say sure, this guy’s a grammarian, he knows what he’s talking about, I’ll try to do what he says. But suppose you’re more of the skeptical type. You find something fishy about the claim. You demand evidence. How would you go about fact-checking this? The best evidence comes from observation of native speakers. And if you go do some observation, it turns out that people are ending their sentences with prepositions all over the place. The supposed rule is quite at odds with how people actually talk. Something’s up. Do people have bad grammar? Or is the rule wrong? This is a rhetorical question of course: obviously the rule is wrong. Let’s think about it. A fat greasy American guy sat next to me on the bus. *A fat greasy he sat next to me on the bus. He sat next to me on the bus. And replace all of a fat greasy American guy with he. [A dolphin [who had been rescued from an oil spill] [which occurred near Japan]] performed a trick. And similarly, I find it odd when people say that adjectives can be used to modify pronouns. This can’t be so, because the adjectives are replaced along with the noun, so they can’t stick around to modify the pronoun. And even if you try and add adjectives, it doesn’t work. The tall woman is famous. *The tall she is famous.